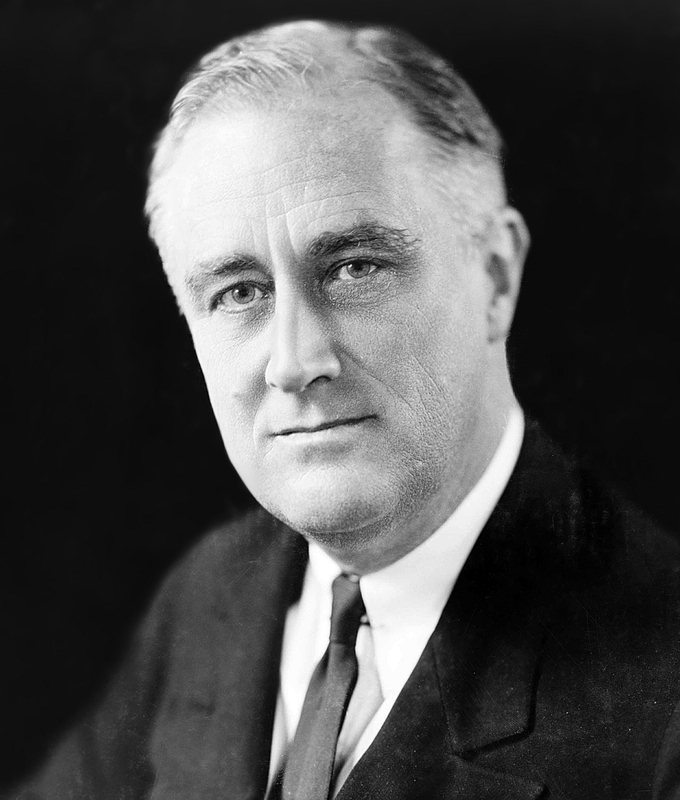 Franklin D. Roosevelt was a famous President from USA, who lived between January 30, 1882 and April 12, 1945. He became 63 years old. Franklin Delano Roosevelt, often simply referred to as Franklin D. Roosevelt or simply FDR, the U.S. 32 president. Roosevelt was one of the 20th century's most important figures as President in a time marked by economic crisis and World War II. Roosevelt was president from 1933 to 1945, and is the only U.S. president who has spent more than two periods. Franklin D. Roosevelt was seksmenning and close friend of Theodore Roosevelt, 26th U.S. president. Franklin D. Roosevelt's wife Eleanor Roosevelt was Theodore Roosevelt's orphaned niece. Franklin D. Roosevelt was diagnosed with polio at the age of 39 years. Roosevelt died just before the war was over, and was succeeded by Vice President Harry Truman. He is born under the zodiac aquarius, who is known for Knowledge, Humanitarian, Serious, Insightful, Duplicitous. Our collection contains 69 quotes who is written / told by Franklin, under the main topics: Intelligence, Politics. "True individual freedom cannot exist without economic security and independence. People who are hungry and out of a job are the stuff of which dictatorships are made"
"The point in history at which we stand is full of promise and danger. The world will either move forward toward unity and widely shared prosperity - or it will move apart"
"Self-interest is the enemy of all true affection"
"We are trying to construct a more inclusive society. We are going to make a country in which no one is left out"
"More than an end to war, we want an end to the beginning of all wars - yes, an end to this brutal, inhuman and thoroughly impractical method of settling the differences between governments"
"It takes a long time to bring the past up to the present"
"The only sure bulwark of continuing liberty is a government strong enough to protect the interests of the people, and a people strong enough and well enough informed to maintain its sovereign control over the goverment"
"The overwhelming majority of Americans are possessed of two great qualities a sense of humor and a sense of proportion"
"Selfishness is the only real atheism; aspiration, unselfishness, the only real religion"
"We have always held to the hope, the belief, the conviction that there is a better life, a better world, beyond the horizon"
"No government can help the destinies of people who insist in putting sectional and class consciousness ahead of general weal"
"I do not look upon these United States as a finished product. We are still in the making"
"I believe that in every country the people themselves are more peaceably and liberally inclined than their governments"
"I ask you to judge me by the enemies I have made"
"I am neither bitter nor cynical but I do wish there was less immaturity in political thinking"
"I am a Christian and a Democrat, that's all"
"Human kindness has never weakened the stamina or softened the fiber of a free people. A nation does not have to be cruel to be tough"
"Here is my principle: Taxes shall be levied according to ability to pay. That is the only American principle"
"Favor comes because for a brief moment in the great space of human change and progress some general human purpose finds in him a satisfactory embodiment"
"Don't forget what I discovered that over ninety percent of all national deficits from 1921 to 1939 were caused by payments for past, present, and future wars"
"Democracy cannot succeed unless those who express their choice are prepared to choose wisely. The real safeguard of democracy, therefore, is education"
"Confidence... thrives on honesty, on honor, on the sacredness of obligations, on faithful protection and on unselfish performance. Without them it cannot live"
"Competition has been shown to be useful up to a certain point and no further, but cooperation, which is the thing we must strive for today, begins where competition leaves off"
"But while they prate of economic laws, men and women are starving. We must lay hold of the fact that economic laws are not made by nature. They are made by human beings"
"Be sincere; be brief; be seated"
"Art is not a treasure in the past or an importation from another land, but part of the present life of all living and creating peoples"
"Are you laboring under the impression that I read these memoranda of yours? I can't even lift them"
"A reactionary is a somnambulist walking backwards"
"A nation that destroys its soils destroys itself. Forests are the lungs of our land, purifying the air and giving fresh strength to our people"
"If civilization is to survive, we must cultivate the science of human relationships - the ability of all peoples, of all kinds, to live together, in the same world at peace"
"I'm not the smartest fellow in the world, but I can sure pick smart colleagues"
"I think we consider too much the good luck of the early bird and not enough the bad luck of the early worm"
"Yesterday, December seventh, 1941, a date which will live in infamy, the United States of America was suddenly and deliberately attacked by naval and air forces of the Empire of Japan"
"Whoever seeks to set one religion against another seeks to destroy all religion"
"This generation of Americans has a rendezvous with destiny"
"There is nothing I love as much as a good fight"
"There is a mysterious cycle in human events. To some generations much is given. Of other generations much is expected. This generation of Americans has a rendezvous with destiny"
"There are many ways of going forward, but only one way of standing still"
"The virtues are lost in self-interest as rivers are lost in the sea"
"The United States Constitution has proved itself the most marvelously elastic compilation of rules of government ever written"
"The truth is found when men are free to pursue it"
"The school is the last expenditure upon which America should be willing to economize"
"Rules are not necessarily sacred, principles are"
"Remember you are just an extra in everyone else's play"
"Put two or three men in positions of conflicting authority. This will force them to work at loggerheads, allowing you to be the ultimate arbiter"
"Prosperous farmers mean more employment, more prosperity for the workers and the business men of every industrial area in the whole country"
"Physical strength can never permanently withstand the impact of spiritual force"
"Our national determination to keep free of foreign wars and foreign entanglements cannot prevent us from feeling deep concern when ideals and principles that we have cherished are challenged"
"One thing is sure. We have to do something. We have to do the best we know how at the moment... If it doesn't turn out right, we can modify it as we go along"
"Not only our future economic soundness but the very soundness of our democratic institutions depends on the determination of our government to give employment to idle men"
"Nobody will ever deprive the American people of the right to vote except the American people themselves and the only way they could do this is by not voting"
"No group and no government can properly prescribe precisely what should constitute the body of knowledge with which true education is concerned"
"In politics, nothing happens by accident. If it happens, you can bet it was planned that way"
"In our seeking for economic and political progress, we all go up - or else we all go down"
"In our personal ambitions we are individualists. But in our seeking for economic and political progress as a nation, we all go up or else all go down as one people"
"If you treat people right they will treat you right... ninety percent of the time"
"If I went to work in a factory the first thing I'd do is join a union"